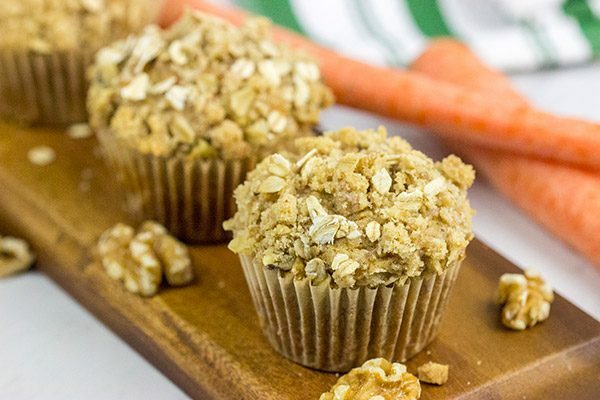 Topped with a brown sugar and walnut streusel, these Carrot Cake Muffins are a delicious way to start a weekend morning! Like most kids of the 80’s, I grew up watching Saturday morning cartoons. DuckTales, Inspector Gadget (I’ll get you next time, Gadget…next time!) and Teenage Mutant Ninja Turtles made regular appearances in our house…usually with a bag of powdered sugar doughnuts. If my sister and I got really lucky, we’d stumble across an episode of Scooby Doo. Today’s cartoons can’t hold a candle to what we had back in the 80’s! Speaking of lesser known things, these Carrot Cake Muffins fit into that box, too. Blueberry, chocolate chip and banana muffins might be more popular, but these Carrot Cake Muffins deserve a spot on the breakfast menu, too! 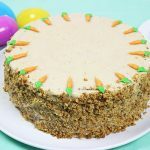 As a kid, I steered clear of carrot cake anything. In my mind, vegetables didn’t belong in my dessert. It sounded like a cruel and unusual way to make me eat more vegetables. Only as an adult did I realize the wonders of carrot cake. 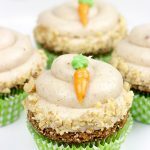 It’s now one of my favorites cakes, and these Carrot Cake Muffins are a fun breakfast-appropriate twist. Folks can be kinda particular about their carrot cake. I personally like some raisins, but not too many. I like walnuts, but I can settle for pecans if I don’t have any walnuts available. I like a generous amount of cinnamon, but I don’t like chopped pineapple. 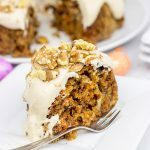 This Carrot Cake Muffin includes my favorite carrot cake flavors, but feel free to tinker around with the ingredients to match your style. Some people like coconut in their carrot cake. Not me. If you happen to like coconut in your carrot cake, then go for it. You do you. I made a batch of these Carrot Cake Muffins last weekend, and Robbie and I munched on a couple while we watched cartoons. We started with his favorites, but I soon had to introduce him to the classic cartoons from my childhood. (Yup, I’ve got most of ’em on DVD.) He seemed to enjoy the throwbacks, and we both enjoyed the Carrot Cake Muffins. If you ask me, it was a perfect Saturday morning! Cheers, friends! 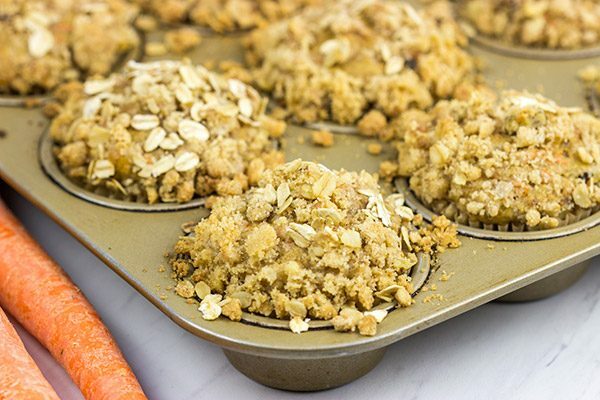 Did you make a batch of these Carrot Cake Muffins at home? Leave a comment! Or snap a photo and tag me on Instagram (@Spicedblog). Using a small bowl, add all of the streusel ingredients (butter, brown sugar, flour, oats, walnuts and cinnamon); stir until well combined. Set streusel aside. Line 18 cups with paper liners, or spray with nonstick baking spray; set pan(s) aside. Using a large bowl, add dry ingredients (flour, sugar, brown sugar, baking powder, baking soda, cinnamon, nutmeg, cloves and salt); stir until well combined. In a separate bowl, whisk together oil, eggs, milk and vanilla. Add liquid mixture to the dry mixture and stir until just combined. Fold in carrots, walnuts and raisins. 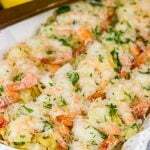 Spoon batter into prepared muffin pan, filling each cup ⅔ full. 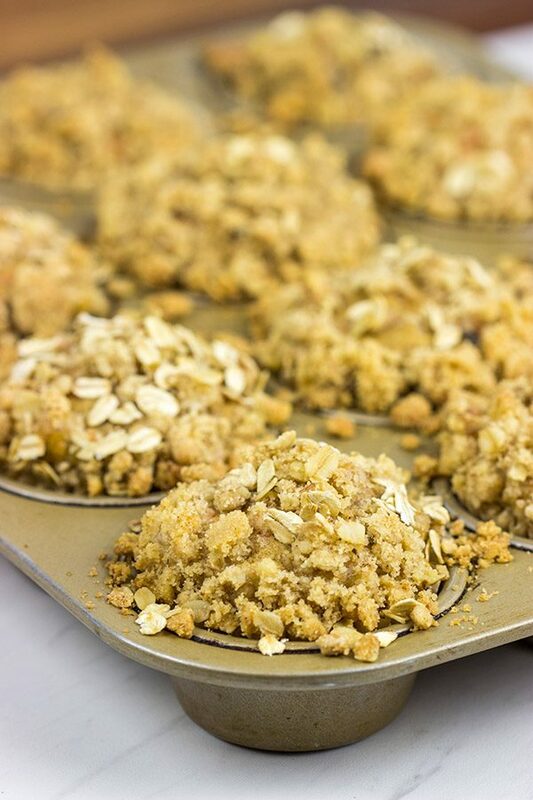 Using your fingers, crumble the streusel topping on top of the cups. Bake for 26-30 minutes, or until a toothpick inserted into center of muffin comes out mostly clean. Let muffins cool slightly before removing from pan. Okay, I am seriously loving this! 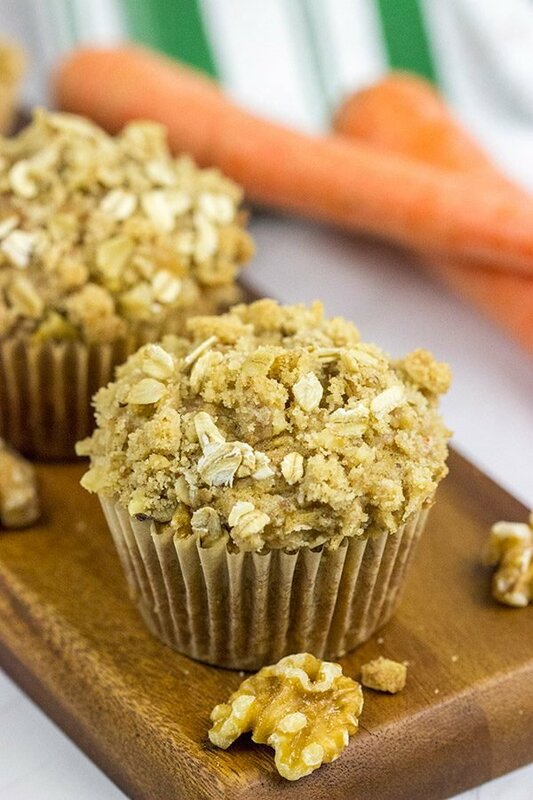 I adore muffins, and the idea of a carrot cake muffin is spectacular! Snuffy was my favorite on Sesame Street too! Oscar was a close second, but I’d forgotten about Slimey. How cute is it that Oscar has a pet? And DuckTales! That was my favorite cartoon. I’d gladly watch some reruns of that with a couple of these muffins today. I’ve loved carrot cake forever (because I was a weird kid who wanted as many veggies as possible) so I love that now I can eat it for breakfast. Oh no, now I’m going to have that Inspector Gadget theme song stuck in my head all day, lol! Love these muffins, David! All the flavors of carrot cake, but healthy enough for breakfast! Thanks so much, Marissa! 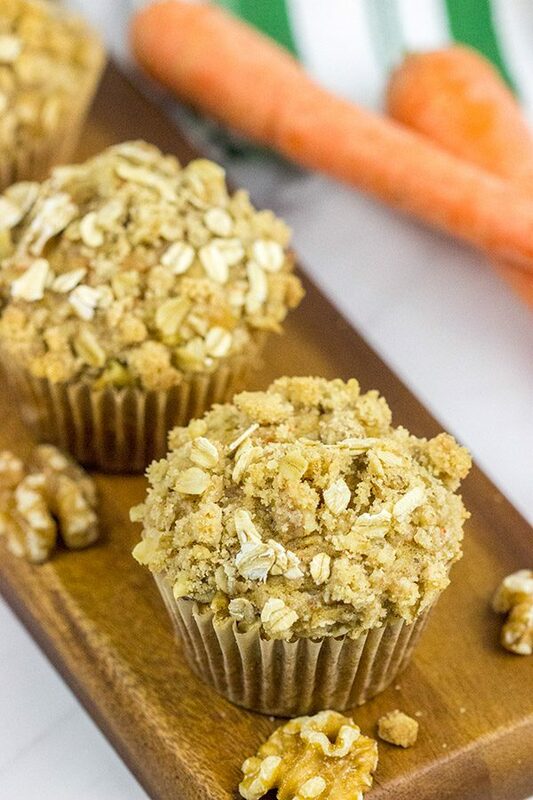 I love a good muffin, and I love carrot cake…so why not combine them into one? I always loved carrot cake but making carrot muffins is even better. I like your streusel with the oats in it. I watched cartoons with my son in the eighties but I don’t remember what we watched. I don’t remember if I watched any Saturday morning cartoons, but I remember the time (the beginning of the 90s) when Disney cartoons finally appeared on Russian TV – that was such a tremendous event! The time was on Sundays either between 4 and 5 or 5 and 6 p.m., and I believe there wasn’t a kid (Or even entire families!) who didn’t watch it. My favourite show was about Chip and Dale – such cute characters. Oh that was a beautiful time! Sadly, I’m not familiar with some of the mentioned names, so I hope for continuation. And while I’m waiting, I wouldn’t mind having one or two of these muffins, please. They look delicious! I like this. I love carrot cake, but it seems that many of them have gone so far over the top that they’ve become heavy monsters. These muffing seems lighter. Cool! I also love cartoons! Yup, I love a good muffin (and streusel topping). These muffins channel the carrot cake vibe…and I’m quite ok with that. Thanks, Jeff! I’m thinking the only thing that would make your Carrot Cake Muffins better would be a piping hot caffè latte. Cookie Monster was my fav. Gotta love a good carrot cake and a good Sesame Street character! I’m sure your wife was so excited to learn she shared a birthday with a worm! 🙂 These muffins look scrumptious and I do love raisins and walnuts in mine too! Hi David! Great post just in time for Easter! You are right, people are particular about what’s in carrot cake. I tinkered around until I got a recipe for my carrot cake just like I want it. I prefer pecans, no rasins, crushed pineapple and coconut in mine. 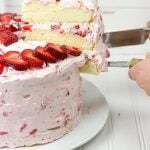 I also like lots of cream cheese frosting and a generous amount of toasted coconut on top of the frosting. Fussy aren’t I? Of course, I would never turn down any carrot cake! 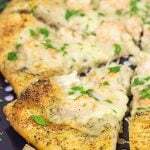 Love the struesel topping! These look fantastic — hoping they’re a great way to start weekDAYS too. 😉 Yum! Serioulsy, Lil S and I were just talking about how good those old cartoons AND movies were – we just watched A Star Is Born and I remarked that I thought it was a great movie with a depth I haven’t seen in many new movies and Lil S informed me that it actually is a remake of a movie from 1937! Oh wel – point proven, eh? Onto these muffins – ooh these definitely do deserve a spot at the breaky table! And, IMO, with all the brithdays and bday cake around this time this year, Id rather have some carrot cake muffins than carrot cake cupcakes! No way! I thought I was the only one who wanted Wile E. Coyote to get that darned bird. Haha. The next time we get together, we totally need to watch some old cartoons. How fun would that be?? Now here’s the one problem. Laura hates old movies. I think she can’t get past the poor quality as compared to today’s movies. Of course, we haven’t watched a movie in about 3 years. On a related note, Robbie is 3 years old. Coincidence? But we still love a good carrot cake creation! Laura wanted to put frosting on top of these muffins, but I told her the streusel was tasty enough. Haha! 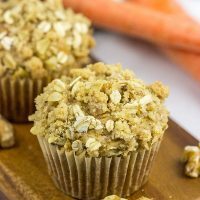 I love carrot cake and making it into a muffin with streusel on top is brilliant! These look delicious and would disappear in no time at our house! Hah! Conjunction junction, what’s your function?? 🙂 Man, those were good times! We used to sneak powdered sugar doughnuts…and then my Mom realized she could just put the bag out and get an extra hour of sleep. I’d make that trade-off! So these muffins were totally a breakfast favorite. So much flavor, and then that streusel on top takes ’em over the top. Thanks, Kelly! Right there with ya! Those were some classics! Loved Inspector Gadget…he would ALWAYS get into something, right?? So, you mentioned that these muffins would be delicious for any weekday morning. Assuming this applies to the weekend too 😉 Those tops get me every.single.time. 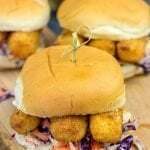 I have to get my ‘go go gadget legs’ to the kitchen and whip up a batch of these, lol. I remember Ducktales and Inspector Gadget too. But my favourite cartoons were Ulysses and Dogtanian and the three Muskehounds. I agree that cartoons nowadays aren’t as good, they don’t get my vote. But these carrot cake muffins do. Yum! Oh man, I’m not familiar with Ulysses or Dogtanian! I’ll have to go see if they’re on YouTube now. I love a good classic cartoon! And maybe I’ll have to bake another batch of these muffins for the cartoon-watching marathon. Haha! Thanks, Neil!